With Sadhvi Pragya Thakur joining the fray, the Bhopal Lok Sabha seat is poised to witness a gripping contest in a constituency that has been a saffron bastion for nearly three decades. 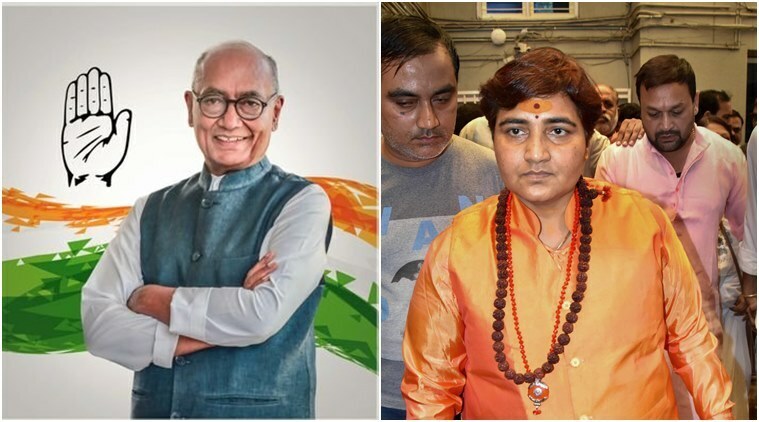 “I am ready for a ‘dharma-yuddh’..I am ready to take on Digvijaya Singh if ‘sanghatan’ (organisation) asks me to do so,” hardline Hindutva figure Sadhvi Pragya Singh Thakur had said last month amid speculation that she could be fielded as a probable BJP candidate in the Lok Sabha elections. On Wednesday, BJP announced that Thakur will contest from Bhopal seat where she is pitted against Congress heavyweight and former Madhya Pradesh chief minister Digvijaya Singh. With Thakur joining the fray, the Bhopal Lok Sabha seat is poised to witness a gripping contest in a constituency that has been a saffron bastion for nearly three decades. Congress has not won Bhopal Lok Sabha seat since 1989. The Bhopal Lok Sabha seat, which has over 18 lakh voters, including 4.5 lakh Muslim voters, will go to the polls on May 12. Thakur, an accused in the Malegaon blast case who is currently out on bail, will be seeking to settle old scores with Singh who, she alleged, conspired to get her falsely implicated in the 2008 Malegaon blast case. She had termed Singh as an “anti-Hindu leader who called Hindus terrorists”. She had also claimed that allegations against her resulted from a conspiracy hatched by the then Congress government at the Centre and that torture by Anti-Terrorism Squad had broken her physically and mentally but her soul was intact. In 2017, a special NIA court had dropped the stringent Maharashtra Control of Organised Crime Act (MCOCA) charges against Thakur and others in the Malegaon blast case, which left six persons dead and 101 injured. She, however, still faces trial under other criminal provisions. The candidature of Thakur to corner the Congress assumes significance as the development comes at a time when the leaders in the top echelons of the BJP have accused the opposition party of coining the “Hindu terror” phrase and slapping “false” terror cases on Hindutva activists when the UPA was in power. Singh, on the contrary, has been a bitter critic of the Rashtriya Swayamsewak Sangh (RSS), the ideological guide of the BJP, and had allegedly linked it to 2008 Mumbai terror attack carried out by Pakistani terrorists. Given Singh’s views on the RSS and Hindutva politics, the election is likely to be fought on polarising issues. Soon after the BJP’s announcement, Singh took a dig at her, saying he hoped she will be “attracted” by the “peaceful and dignified” environment of the capital city. The Congress stalwart took to micro-blogging site Twitter to “welcome” the right-wing activist, who spent several years in jail before being granted bail in 2017. He said he hoped the “peaceful and dignified” environment of Bhopal would “attract” the saffron leader. “I welcome Sadhvi Pragyaji in Bhopal and hope that the picturesque city’s peaceful, educated and dignified environ would attract you,” the former chief minister tweeted. “I pray to Maa (goddess) Narmada for Sadhviji and seek blessing from Narmadaji (holy river) so that we all walk the path of truth, non-violence, and religion. Narmada Har (glory be to the Narmada),” Singh said in another tweet.